Some children seem to be born more pessimistic than others, but optimism can also be systematically taught. And a child with a higher degree of optimism is more likely to resist depression, be health physically, persist at difficult tasks, and succeed in school and later life. In fact, children with high 'optimism' scales are more likely to outperform in college what their SAT and achievement scores would predict. The picture below shows that students with higher anxiety scores are more likely to have lower levels of amygdala activation when viewing photographs of 'happy faces.' Of interest too, the higher anxiety subjects were still within normal ranges of personality. Gifted children may also especially prone to existential depression, and studies of gifted children have shown that gifted students may react more intensely than average-ability students to frustration. Studies of stress and burn-out in gifted students suggest that key factors can be an inappropriate level of intellectual stimulation ('underload' or 'overload' as Hoekman et al. have recently commented). One helpful book offering a step-by-step program to improve a child's optimism is Dr. Seligman's The Optimistic Child . It provides practical instruction on how to encourage children to see failures and setbacks as temporary, limited, and impersonal. Hoekman, McCormick, Barnett, 2005. The Important Role of Optimism in a Motivational Investigation of the Education of Gifted Adolescents, Gifted Child Quarterly, Spring 2005 (not online). Science fiction can be used to teach creative and critical thinking, social, biological, and physical sciences, art, math, literature, technology, history, and futurism. Flashes from the Past: "Do not let this boy in your school..."
His principal had taken the time to write a letter saying, "Do not let this boy in your school under any circumstances," but as he recalled, "... I got in the car and drove up there and got in time for registration. When I reached the desk, they looked at me and said, "We told you not to come." I said, "I know you did, but I didn't think you meant it." He was a kid who "stayed in trouble all the time," and he was frequently expelled for pranks and insubordination. Although he managed to wrangle his way into the university, he rarely went to classes (although enjoyed reading in the library) and dropped out after 2 years. He went into the National Guard, but was court-martialed for leaving the base without permission to visit a girlfriend, whom he later married. But he did love to write. In response to a interviewer's question, "How did you get interested in writing?, he said "I'm sure my interest began in an interest in reading, which then was translated into an interest in writing...I was about 11 years old. I won a copy of "David Copperfield." Up to that time I'd read the "Bobbsey Twins" and then "Tom Swift" and the "Rover Boys" and "Tarzan," but since I got this as a prize, I decided I should read it. I found a world that was realer than the world I lived in, unlike these Tarzan and other books. This was a whole other world, and it was a world of art. I couldn't have defined it as that, but, one thing, I knew "David Copperfield" better than anybody I knew in the real world, including myself...I remember vividly having that reaction to that book "David Copperfield." I think most writers probably have that experience." Who was this? This was Shelby Foote, who died just this past Monday at the age of 88. Shelby Foote was best known as the lyrical historian on Ken Burns' Civil War documentary. Foote's Civil War: A Narrative has been ranked as No. 15 on the Modern Library's list of the century's 100 best English-language works of nonfiction. He really did have a way with words. We came across these excellent links at Kevin Karplus' website. His brief comments on the sites are also helpful - we demo'ed ALEKS and were disappointed as well. EPGY math may also not allow enough opportunity to return to subjects. Do you have experiences with these programs? If so, please post comments if you get a chance. The NAGC has sent out an alert to contact your senator about Javits funding for Gifted education. The appropriations committee meets July 12. Trends in Cognitive Sciences has a nice review on the 'top-down' cognitive direction of visual perception. We see more when we are expecting to see more. It's like this gray and black picture below. At first glance, we may not recognize it, but with further inspection we can fill in and organize what we see into a figure. Many people are aware of these sorts of 'eye tricks' in the form of optical illusions. But, visual perception has extensive relevance to many aspects of learning, expertise, and some forms of disability. Perceptual learning is big news because it highly trainable and involves 'rewiring' the brain. Computer-based programs are ideal for perceptual training, but existing commercial programs are fairly simplistic, although that probably won't be for long. Training in visual perception has powerful implications for many groups and conditions, including athletes, workers who require visual discrimination as part of their occupations (quality control, air traffic controllers, umpires, chemists, architects, engineers etc. ), visual experts (artists, bird watchers, antique appraisers, chess masters etc. ), and children and adults who have conditions such as dyslexia, nonverbal learning disabilities, visual distractibility, prematurity (periventricular leukomalacia), or autism. What can you do now, if you have a child with visual perceptual problems? First look for visual factors that may improve or detract from their visual ability. Vary the light intensity, color, and visual crowding. Could there be a problem with seeing movement? If so, slow it down. Try simplifying visual settings to see if it helps their visual search or orientation. Use words and touch to help them correct visual errors, spatial mistakes or size distortions. Have them draw and build, and give them plenty of time to study and compare what they see with what they perceive in terms of space. Many adults are able to compensate very well for visual perceptual problems, but they had to learn it gradually. When we make decisions based on risk, it matters whether the possibilities are framed in a positive or negative light, what risks are matched to possible benefits. People are likely to opt for 'certain' rather than 'risky' options when only good outcomes are offered, but tempted to make riskier choices confronted with two negative possibilities. This pattern of decision making has always been a bit perplexing because the choices (certain-good, risky-bad) seem to be somewhat contradictory. There are different possible reasons for this (see the paper for more discussion below) - but one theory posits a compromise between desire to make a good decision and desire to minimize cognitive effort, while the other suggests a compromise betweens fears and wishes of an individual. This recent study found the cognitively 'easy' choice for a certain positive gain matched well with fmri activation data. 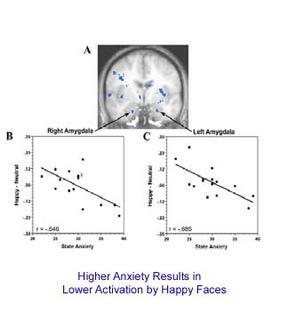 The negative condition required more brain work under both conditions, and that also showed more imagery area activation (blue arrows) than the simplest positive-certain condition. Imagery, it seems, is very important in making decisions under uncertain conditions. This figure shows you the extra work with multiple word meanings. Although sometimes we see parents or teachers who are concerned that a child's difficulty in getting jokes is due to autism, it takes a lot more brain work to figure out words that have several possible meanings, and it is also an ability that improves with age. We just excerpted two key figures, but the main point to notice is that ambiguous words take more 'frontal' activity and right hemispheric activity- keeping different possibilities in mind, generating alternatives, and then choosing one on the basis of the best fit or pattern. Many children have difficulty with figuring out word meanings - sometimes it is developmental, sometimes it is attentional or memory related, and it can occur in many different kids with language challenges. Multiple word meanings come up all the time in English, and we probably need to quiz kids more to see if they really understand the meaning. Some of the links below may be helpful to some of you. Word play sites are also good practice for speech fluency, prosody, and of course, just for fun. Since we're going to be doing U.S. History next year homeschooling, we've been looking for a site like this. Excellent links too. In this very interesting study from Washington University St Louis, Schlaggar and his group find that children use action and movement-related areas of the brain to generate words. This is a nifty study because the investigators matched children and adults who showed an equivalent performance. So we are really seeing how kids (age 7-10) use their brains differently from young adults. The word generation trials involved several different ways to generate words - matching verbs with nouns (car & drive), rhymes (cat-hat), and opposites (up-down). What you can see is that adults (red) tended to use their 'classic' left hemispheric language area to generate words, while kids (blue) were using their right occipitotemporal region, a region involved in multisensory imagery for action and movement. So it seems children are closer to the 'source', associating words with direct sensations and imagery, while adults have gone on to file word knowledge away in their word definition library. Found some nice links for Math and Learning Disabilities in a course syllabus at Johns Hopkins University. Some of them are rather technical, but show us how many different ways math performance can be affected by a disability or individual cognitive challenges. Analogical thinking has always played a powerful role in scientific innovation, but now the contribution of multimodal imagery is also becoming clearer. Some 20 or so years ago, John Clements found that analogies played an important role in the problem solving abilities of scientists. Given a physical problem involving coiled springs, he videotaped and interviewed them as the were able to figure the problems solution. The analogies that the scientists used usually bore some functional or structural similarity to the unsolved problem, but several observations were notable: the solutions were not sudden (some only solved the problem after an hour or more), most adopted analogies only tentatively at first, the analogies seemed to based on structural or functional features, and most of the work seemed to be involved with testing and challenging the favored analogy. Ultimately the correct answer was arrived at by associational and inferential conclusions, rather than deduction. Now in this latest paper from John Clements, he has become interested in the role of personal dynamic / kinesthetic imagery in bridging the analogical concept and physical problem. Hand gestures and movements seemed important for representing forces, and visualizations (combined with gestures) were important for reaching final conclusions. Studies such as these are an interesting look into the problem solving process and they offer interesting questions as to the best ways to expose students to these approaches in their school training. There are variety of successful problem solving traits of these scientists - persistence with a problem, willingness to suspend judgment, flexibility to possibilities, and facility with personal imagery. We also included some research papers which looked at the introduction of analogical teaching in science classrooms. There are some differences presenting experts vs. novices with analogies - many experts love analogies because they start off with a richer foundation of knowledge. Analogies help you if you already have a lot of information because it simplifies and groups what you already know. However, for the novice, analogies might just seem to be a pattern to be memorized - and so the likelihood that it will be learned as it should be as a tool for other situations is unlikely. The first chemistry paper below looks at an obviously very creative teacher who explores many analogies with chemical events in his classroom. But the concern would be that he adopts too many different and non-specific analogies that his students don't get a chance to test it out or see how the analogy could lead to particular predictions or testable hypotheses. Finally, as a brain break, if you're interested, check out the funny 'bad analogies' link in student writing or the winning entries in the 'bad fiction' of Bulwer Lytton ("It was a dark and stormy night..." below. Flashes from the Past: "He was a bit of a dud in math..."
In school, he seemed to be a bit of a dud in math, and in fact he was held back one year when he had trouble learning mental math. He was rescued in his teenage years when an insightful teacher realized he needed more time. "I used to take these maths tests which were supposed to be done in one period and it took me not just that period but the next one which was a play period and somethimes the one beyond that before I finished the test. And it was only then that I started to do well." Who was this super-slow thinker? This was Roger Penrose, now mathematician and physicist, discoverer of Penrose tilings, and author of many original thoughts in geometry, relativity, quantum mechanics, and theories of consciousness. It seems that if you are a slow thinker, you may still think well. Offered Penrose, "My own way of thinking is to ponder long and I hope deeply on problems and for a long time which I keep away for years and years and I never really let them go. I'm pretty tenacious when it comes to prob"People think of these eureka moments and my feeling is that they tend to be little things, a little realisation and then a little realisation built on that." And "...these little things may not seem like much but after a while they take you off on a direction where you may be a long way off from what other people have been thinking about." Some people use distractibility and impaired sustained attention interchangeably, but they are different. Some people have quite strong abilities at being able to sustain attention, but they may also be exquisitely sensitive to distraction. In this study, we get a chance to see why distractions make it hard to learn. The areas of the brain (prefrontal) that are necessary to resist distractions are exactly the same areas that are needed keeping information in mind. It looks like a direct competition. Other interesting details - we are more sensitive to distraction at the limits of our memory (the more challenging the task) and when the distracting sounds are fluctuating, rather than constant like a hum. Here's some practical information for making you an effective teacher - better to teach in short repetitive bursts, than all in one sitting. In the study below, children whose teaching consisted of three 2-min sessions per day (for 2 weeks) showed more than six times the improvement of those who were taught for one 6-min session per day. Sounds a bit like how good TV documentaries are designed: tell'em what you're going to tell'em, tell'em, then tell'em what you told'em. In this important study, researchers from Johns Hopkins found quite striking evidence of inflammation in the brains of people diagnosed with autism. The ages studied ranged from 5 to 46 years, and the main brain region affected with inflammation was the cerebellum (see also post below), a site important for motor planning and coordination, but also sensory-motor coordination, autonomic activation, and attention. In the middle picture below, see how there's less of the dark purple dots (loss of neurons). On the right, the brown dotted staining showed areas of inflammatory activation in microglial cells. The findings raise important questions like: what is the inflammation in response to? and is there any way that treating the inflammatory response can improve brain functioning or the course of the disease? With this new information, autism is more clearly a neurologic rather than psychiatric or behavioral disorder. Studies in progress are evaluating possible laboratory tests to aid in the diagnosis. Sites for 'automatic' learning in the brain are regions like the cerebellum, that help coordinate information coming in from the senses, motor plans, and adjustments that the body has to make when its doing something. Traditionally, brain regions like cerebellum have been relatively neglected by neuroscience research (conscious regions have attracted more attention), but now the cerebellum finds itself at the center of attention of some of the most critical childhood behavioral syndromes of our time: ADHD, autism, and sensory integration dysfunction. In fact, cerebellar abnormalities are now recognized to be the dominant site for inflammation in autism (see post above), but it is also the site for abnormalities in ADHD, and from injuries due to birth injury, prematurity, or low birthweight. Part of the reason that cerebellar problems may present with behavioral difficulties is that the cerebellum directly connects with the hypothalamus. It is a relatively primitive part of the brain that can activate the autonomic system direcly, and affect mood, arousal, and attention. Also because most of the cerebellum's actions are not under directly conscious control, some of these other activations may occur 'without thinking'. Unfortunately the excellent Dysmetria of Thought article below is not yet available for free access. But in the coming year, there will probably be many more interesting studies about what makes 'automatic learning' difficult in ADHD, Autism, and SI. It's tough when there are so many to pick from, but for this Father's Day, we chose a father whose son grappled with significant disability. His son had misfortune of starting out life with German measles. At birth the boy only saw lights, shadows, and colors, but then he lost all vision at the age of 4. In fact, the day he came home from the hospital, he later recalled that when he asked for his favorite coloring pencils, "my father had notched each pencil in a distinctive pattern so I might still know which color went with which pencil. He also cut letters and numerals out of paper so that I could learn what (my brother) already knew..." So from the very beginning, this Dad was determined to include him in everything. What point, one might think, was there to be teaching a blind boy so much about nature's diversity? Well, this boy grew up to be Geerat Vermeij, Professor of Marine Ecology and Paleoecology UC Davis, MacArthur Fellow and publisher of almost 100 articles and 4 books, including who published nearly 100 articles and 4 books, including his autobiography: (Privileged Hands: A Scientific Life ). Vermeij's dad was a remarkable example of steadfastness, optimism, and encouragement. He saw the big dream and he gave it to his son. Have a great Father's Day weekend. When words are stored in the brain, they are stored in complex ways - as verbal definitions, visual pictures, sounds, personal contexts and emotional associations, and as movements. When we gesture, this study below finds that the movements help speakers retrieve words. If you stopped the movements, you stopped fluency. Another interesting tidbit that turned up, people tended to gesture more when their were trying to describe a visual pattern that wasn't easily named (drawing with their hands) and objects that you could touch or manipulate. They speculate that when we learn about tangible objects, we register our knowledge and memory of that with sensory/motor memory as well as with words or sight. All this implies that language learning should be a vivid affair. So go ahead and add drama to your family or classroom readings - may a bold sweep of gestures and accentuate your voice. This is really multisensory language - language that is sound, music, rhythm, movement, visual, and emotive...much more than words only. Another rumination on this work is that folks with with sensory-motor challenges are disadvantaged if they don't have 'in sync' sensory-motor / movement systems as the learn and use words. In the optimal state, many large scale brain networks work in integration with each other. There may be surprising other consequences when one system becomes impaired. If you've got Potter fans in the house, here are some nifty links. We also just discovered the Yahoo 'Hogwarts Summer Correspondance School' too - a terrific (and free) site. You need to register an email address, but then can download lots of very imaginative and whimsical files. Our kids favorites - Hermione's logic puzzles and the mock daily newspapers (you have to join the different subgroups or classrooms - the newspapers are under Literature). Some of the materials these parents dreamed were a lot like my son's Hobbit course through Northwestern's gifted online school (CTD). Yahoo groups are clunky to negotiate, but there's a lot of stuff there - mini textbooks on 'Herbology' (really Botany and nature activities), Astronomy, etc. Some of the Potter spins are quite clever. Our kids may try their hand at writing a 'newspaper'. For those who study Latin, that is also fun aspect of the books. In fact, HP is now published in Latin as well as Ancient Greek. When J.K. Rowling graduated with double 'firsts' in Classics and French at the University. In fact, she's said she modeled Hermione after herself. Executive functions are clusters of 'overseeing' brain activities that include regions to make decisions, focus attention attention, inhibit certain impulses, and allocate memory resources. Executive functions are often at the center of research on ADD and ADHD. In this recent paper from the University of Minnesota, there's new information that spatial memory, spatial multi-tasking (keeping different bits of visual information 'in mind'), and visual strategy undergo dramatic development from ages 9-10 to 18-20. The youngest group (age 9-10) were the lowest performing for all of the visual-spatial tests, and in fact, improvements in memory and the ability to organize visual searches strategically or in an orderly fashion continued to improve between the ages of 16-17 and 18-20, so that the central 'Executive' was still getting a lot smarter into young adulthood. It's important to look at study such as this (sorry, can't share the original publication with you as it's not yet Free Access) because it cautions us about accepting developmentally unrealistic expectations for executive functioning in school children. Admittedly we're in a situation to see kids who are having trouble in the school system, but why should some kids are made to feel like they're failing life when even though they're only 7 or 13 years old and still developing? Our most common referral age for possible ADHD is 7 years old, and some studies have suggested ADD / ADHD incidence as high as 5-10% of all boys. Do we really think all these kids need to be on meds? There has been a lot of new information coming out about the normal course of cognitive development in kids, and this is all good. But we hope the right people are listening. There are profound implications here for the re-structuring of education and assessment, not to mention behavioral or psychological strategies for diagnosing. As for us parents, we think the take-home point for this study should be that we should try to be more patient, try to be more encouraged, and try to be more encouraging. Growing up our 'Executives' takes time for everybody, and there's a lot to do in the meantime. "The Internet has unique, even transformational qualities as a communication channel, including relative anonymity and the ability to easily link with others who have similar interests, values, and beliefs. Research has found that the relative anonymity aspect encourages self-expression, and the relative absence of physical and nonverbal interaction cues (e.g. attractiveness) facilitates the formation of relationships on other, deeper bases such as shared values and beliefs...Despite past media headlines to the contrary, the Internet does not make its users depressed or lonely, and it does not seem to be a threat to community life--quite the opposite, in fact." There are always be naysayers, though, like here. But in even a large German study that concluded that math and reading suffered in households that had multiple computers, they also found that "academic performance rose among those who routinely engaged in writing e-mail or running educational software." Any student of creativity or innovation knows that changing disciplines seems to be a way of keeping 'fresh' and getting new ideas. Louis Pasteur got his start in crystallography, but then started solving problems in fermentation when a student of him brought a problem to him from a factory. When a devastation of silkworms happened in Europe, they call Pasteur who exclaimed, "But I know nothing of silkworms." Nevertheless, he ended up solving the problem of silkworms and crossing over into the fields of microbiology and immunology. In Root-Berstein's study of innovators, he found "In every case that I have been able to examine, researchers who continued to be productive past middle age changed fields regularly. In effect they periodically returned to the state of a novice by taking up a new subject. They broke out of the patterns of work and thought to which they had become accustomed." Maybe it's as Nobel Prize winner Peter Debye said, "...ask for people who have enough brain power that they at least have a feeling of how to handle a new problem. The specific nature of the problem is not important." What does these people look like as young people - well we don't know for sure, but we have a hunch. We see some extraordinarly bright kids who have very wide ranging interests. Sometimes they are not easily contained by the classroom, but the journey sure looks very interesting. Flash from the Present: "A counselor told her parents she was not college material..."
A college counselor told her parents she was not college material, but her parents rejected that idea flat out. She was playing piano for family get-togethers at age 3 and she was raised in a 'stimulating environment' that included youth group, piano, ballet, French, flute, violin, speed reading, and church. Her parents were a pastor and a music teacher. She entered college at age 15 with the idea of being a concert pianist, but then on the competition circuit she met "11-year olds who could play from sight what had taken me all year to learn." She shocked her parents when she told them she was changing her major from music to political science. Her father said, "Black people don't make money in poligical science." She replied, "Music, either." This gal went into a Masters program at 19, then after finishing, got a PhD in International Studies. At 26, she became an Assistant Professor at Stanford, and soon made full professor. At 38, she became provost of Stanford - the youngest, first non white, and first woman to hold the position. She balanced the $20 million budget deficit in 2 years. Can you guess? This is Condoleezza Rice, Secretary of State and still a concert pianist- she gave a charity concert at the Kennedy Center last weekend to help out Tom Lantos' granddaughter, an opera singer recently diagnosed with pulmonary hypertension. That's a first for Secretary of State too. Why is it that some people give up easily? What's different about the ones that persist? Do they have better attention? Do they have better drive? Well, this brain imaging study suggests that some people are better at being able to activate their medial reward systems - so that they want to do the task - even if the task is uninteresting. We just excerpted a few pictures below (and put the eyes in so you could get a better idea what you're looking at) and the paper can be read in the open access NIH paper database at PubMed Central. When we're troubleshooting a child's poor task persistence, we need to think about several things - can a child do it (could a disability be the problem? )?, are there ways to improve motivation (internal and external rewards) within the educational setting?, and are the conditions ripe to foster a feeling of competence (can the child experience some success while being incrementally challenged). Check out other articles below on Temperament and School Behavior, and Fostering Resilience. Our senses unite to give us representations of the world. When one modality is lost, distortions and confusion result, but the solution is interact even more with the world. In the figure below, researchers find that blind and control subjects activate similar areas for similar objects. Sighted people see a tube of toothpaste and have a tactile imagery of what it feels like. Blind people only have a tactile imagery. But the image is a representation or a generalization that the brain makes about what it is. And imagery is formed by an ongoing feedback between the senses and the brain. There are many conditions that give rise to sensory processing disorders in children...the most common are probably mild birth injury or a inherited disability. Children who have inconsistent imagery for steps, escalators, dogs, and new environments will be afraid of all these things. Over time (if left to their own devices), they will explore less rather than more. What parents, therapists, and teachers can do is guide them in their exploration and help them to gain confidence with understanding their world with whatever intact senses they have. These general principles apply to many children with sensory disorders (for instance those with visual or auditory perceptual abnormalities or those with impaired position sense). In the figure below, the top picture shows the pattern of brain activation in sighted test subjects. Note the overlap between touch and sight. Below is a simlar representation observed in blind subjects that used touch alone. The ability to think flexibly is important for problem solving and creativity, amd it improves with direct modeling (examples). Flexibility is not the only factor for successful problem solving...selection is equally as important, but it is particularly important in situations in which information is ambiguous or conflicting, or incomplete- and when something totally new is needed. Based on work by Amabile and others, childrens' fluency of ideas are found to best stimulated in environments that emphasize a great deal of freedom, individuality, playfulness, and ideational risk-taking. We provided links to other papers on encouraging and teaching for flexible thinking, including some more technical papers which look at cognitive flexibility theory. In work at Oxford (below), Geake and colleagues used the Verbal Similarities task as model for gifted flexible thinking, but we shouldn't forget that that approach only looks at language. Flexibility in visual thinking uses other pathways, and it is possible to be very good at way, but not the other. We'e also put in a link to an interesting paper involving high functioning autistic kids and young adults. There researchers found that their test subjects were quite strong in 'design fluency' (visual fluency task), and in fact generated as many new visual designs as their controls. What autistic subjects struggled with, though, was language - and for verbal fluency tasks, autistics scored far lower than a globally learning-disabled (retardation) control group. There's some important stuff here. It's a reminder to us to foster the gifts of autistic students in visual design and problem-solving. Too often we may get preoccupied with their language and social needs, but their visual strengths may help them develop their expertise, interest-based friendships, and careers. In this study, the autistic group had some difficulty intrusive errors on design tasks, but importantly, they could recognize when errors were made. This means that educating for visual strengths should always incorporate at least a 2-step creation process- first generating ideas, then going back to throw out errors and select optimal designs. p.s. Can't remember what brain regions were important for design fluency? Check out our prior post on the Tower of London task here. By the news article, we don't know whether this protest was initially student-motivated or parent- or teacher-motivated. Anyway, it is true high school students who are passing their classes, but failing the WASL, have a lot to lose by being denied their diplomas. If they fail to win a diploma, the statistic prediction is poor: more likely to be unemployed and on public assistance, and much lower average salaries. Average salaries for young adults are $19,000 no diploma, $26,000 diploma, $31,000 some college, $42,000 college or higher. Our son found this site - hilarious animated "Last Minute Book Reports" - Little Women, Don Quixote, etc. Computer Use Begins Even Earlier! Computer users are getting younger - the latest statistics: 67% nursery school students use the computer (23% are on the Internet), 80% Computer 32% Internet by Kindergarten. By the time kids are first graders, it's 91% Computers and 50% Internet. There is a complex relationship of reward and motivation for school aged kids, and the answers are simpler when children have high intrinsic (internal reward) motivations and flexible educational options. But when a child's performance begins to slip, and motivation and achievement drop, it becomes more difficult knowing how to regain intrinsic motivation and use extrinsic incentives to improve achievement. "Preference for Challenge" similarly decreases. And yet, what can you do? Providing incentives is a tricky business. If you take something that a child naturally loves and then provide money as an incentive, research studies suggest that your scheme will backfire. In a classic experiment (repeated many times), Deci found that college students not paid to play with a puzzle played longer with it and had more interest in it, than students who were paid. As a result, the rules of reward are different when it comes to intrinsic interests. Praise and encouragement seem to be fine, but money has an opposite effect. If you want to check out Amabile's Creativity Killers, see the Art of Creativity news article below. On the other hand, incentives may work well for activities that don't require a great deal of creativity activity like completing math worksheets. It's valuable to think about contextual factors in motivation as well -where a child feels he is starting from, whether he perceives or knows he has slipped, and whether he now feels he is successful at his work. Sometimes we see kids when they have been experiencing repeated failure, and it's important to give them a break, to aggressively pursue accommodations if they are appropriate - so they can experience success and have more psychic energy to work on difficult tasks. Many parents can succumb to catastrophic thinking - if they take accommodations now, maybe they'll always be dependent, etc. etc., but that's not what's going to happen. On yesterday's post about Kids and Reward, we found it interesting that the researchers cited Tversky and Kahneman's work in their design of a 'random' number guessing reward paradigm. Children were overly discouraged when win-losses were about equal. They needed to win:lose at about a 2:1 ratio to be motivated and excited about the game. It's no different in school (or in video games for that matter). Motivation is a powerful tool in the classroom. We just need to know how to use it the right way to push their learning onto a new level. This is a summary of the original research paper, but it's an accurate one. Impulsivity is probably the most easily trained of behaviors associated with attention deficit hyperactivity disorder. In this study, high impulsivity was most highly correlated with a "lax" parenting style with inconsistent consequences for misbehaviors. Families with high emotional reactivity on the part of the parents (got very upset at children) were also at greatest risk for having children with impulsive behaviors. The most important point, though, was that children's impulsivity really decreased in response to more structured discipline (after parents received instruction). Hope this helps someone. Teens do have a real alteration in their sleep cycle that makes them prefer staying up late and sleeping in. This is a normal development at this age. But this study found that teens had real effects on cognitive performance and mood. The researchers suggested giving tests in the afternoon and changing school start times. Some interesting articles about motivation and love (below) got us thinking about implications for education. In a paper released this week, researchers found that brain areas associated with feelings of romantic love were located in subcortical reward centers like those indicated below in red arrows. At right an fMRI picture of children and adolescents'subcortical reward centers activated by the possibility of a monetary reward. Look at the similar locations. The areas are not exactly the same, but they are similar, and in fact if you look at the "Love" study in more detail, there were different areas of these reward regions activated when different traits of the "beloved" were considered. We probably don't think enough about what children love when it comes to educational planning, and yet reward has powerful activating influences on the brain...even opening up new areas of memory (here). The mathematician Poincare has written:"The scientist does not study nature because it is useful to do so. He studies it because he takes pleasure in it, and he takes pleasure in it because it is beautiful." Interestingly, beauty also activates these subcortical reward centers (here). He wasn't a star pupil. He failed math one year, and was arrested for hitching up a wagon to some skyrockets. He admitted didn't care for school very much, but had other interests: "A fellow student and I had a far more absorbing project than our school books. We were building an automobile in my father's garage." Then one day, "I saw in an astronomy magazine an ad about a book called "The Rocket to the Interplanetary Spaces," by Hermann Oberth. I wrote for it at once. To become an engineer and to build such rockets -- that would be a challenge worth living for, I figured. To my dismay, he told me to study math and physics. But in the glamorous prospect of a life devoted to space travel, these subjects took on new meaning for me. Determined to master them, I buried myself in their mysteries, and after a few years I even succeeded in graduating a year ahead of my class." Who was this fellow? This was Wernher von Braun, the father of modern rocketry. Love can do amazing things. It made him learn complex math. Another interesting note on von Braun's life. He entered a field (rocket propulsion) that didn't exist when he was a boy. It seemed enough to just learn what he needed to know. Here's a reminder to keep comics in your curriulum. Looking at the funny cartoons actually tickles your dopaminergic mesolimbic reward system (aside: these are the brain regions we want to activate in ADHD), and the funnier the comic is, the more activation it gets activated. Sure beats medication. We've also included some Superhero & Science articles to get you thinking. We've been reading Science of Superheroes with our kids and they are enjoying it. The book is a playful tweaker's book, and it models looking to science or nature for ideas and applying knowledge. Some chapters are better than others, but so far we enjoyed Spiderman (walking on walls, silk, radioactive insects, etc.) and Flash (friction, metabolism, sonic booms, speed of light, etc.). There is a new article posted in Nature Neuroscience (sorry, not available free online yet) about Dyslexia and visual perception. The article below heralds "Dyslexia Redefined", but that's hype. The research provides more evidence that dyslexia involves perceptual abnormalities in vision...so not sound only. More specifically, Seidenberg and colleagues at Georgetown found that dyslexics had problems perceiving visual stimuli in the presence of visual 'noise'. They hypothesize that these problems could be part of a general problem in noise exclusion (sound discrimination problems), or speculate that it might account for why dyslexics have trouble with visual crowding (seeing all the letters at once). Self-reflective thinking is making a comeback in school curricula and the homeschooling movement, and it also seems to succeed on standardized tests of achievement and problem solving assessments. The scientific paper below shows the different pattern of brain activation seen with self-reflective thought - the difference between determining the truthfulness of a fact, and making a qualitative decision about oneself ("I'm a good friend"). The areas that appear to be important for self-awareness are in the frontal areas, the posterior cingulate, and a bit of the temporal lobes. The researchers tried to distinguish self-reflective statements from autobiographical ones by avoiding questions that would require vivid personal recollections, and by checking scans more quickly (2 sec) than most autobiographical studies require (4-20 sec). These areas that become activated are similar in location to areas implicated in 'theory of mind' (predicting the thoughts of others). Examining one's own thinking is a foundation for Socratic thinking, a technique which emphasizes direction questioning of students so that they examine the opinions they have made and the assumptions on which they are founded. There has been a resurgence of interest in Socratic instruction - from public, private, and homeschool sectors. Generally this approach requires a small class size and good teachers, but otherwise many different types of students seem to benefit from this approach. Our highest scoring public middle and high school in Washington is the International Community School in Bellevue (admittedly this is an affluent area). It is a 'choice' school and lottery chosen, not hand-picked or gifted only. They apparently employ an "Essential Questions" and "Habits of Mind" approach, integrated but fairly classical pattern of studies, and have an impressive statistics on the WASL, a test more geared toward problem solving than fact mastery. From 2004: 100% 10 graders passed Reading, compared to 60% for the state average. Math Scores were 88%. Another local classical Christian school (Bear Creek) which was started as a homeschool extension center in 1998 and teaches Latin, Rhetoric, etc. also posted fairly dramatic educational statistics which included middle 50% Junior year SAT's as 600-690 on verbal, 600=690 on math. Retro, it seems, may be a good way to go for some students. Additional links below include Understanding By Design, which discusses more the "Essential Questions" approach to curricula. Along the lines of more teaching by questioning, here's a link to the Lawrence Berkeley site where scientists talk about what questions drove their particular line of research. Examples include: Why do people age? How can you carve with light? or Why do the digits of pi look random? Observation is one of the most important tools for innovative thinking, although it is not a simple matter to teach. When observation is done well, it's often because of love, 'flow' or a bit of obsession. If delight isn't there or worse if it's coerced, then it may be just a little bit of going through the motions. It's not a simple process learning how we learn through observation. In a previous post (here), we've seen how experts can abstract information more quickly through observation, but in other experiments, these researchers also saw how an expert artist was able to direct his seeing (using infrared tracking of eye movements) in a way that might yield more information as well. Compare the infrared tracking movements of the artist vs. non-artist below. Look how different the artist viewed the face, encircling the eyes and face, almost like brushstrokes. Now here's another interesting tidbit we can learn about learning by observation - it's not always conscious. In the McGill study below, researchers found that distraction did not interfere with people's ability to learn a motor movement by observation. The resesarchers hypothesize that the learning process somehow involves the development of internal representations - so that even if you're distracted while you're watching, it can be demonstrated that you still are able to learn. It's interesting to think about the sort information that comes in that is not entirely conscious - perhaps its this sort of information that gets kicked up with insight-based or non-deductive thinking. We just had an opportunity to try out the new software Phonomena, and we're sorry to say that it is disappointing. Apparently Mindweavers is interested in making adjustments in their program in the future, but in its current form we would not recommend it. There is no on-screen help for a child, no separation of games into manageable levels, and a loud and very irritating buzzer that will be difficult for many children to tolerate. If you miss a 'b' or 'd' sound, the programs blasts this grating sound at you. Apparently there's not even a way to turn it off? Are the folks at Phonomena aware that people with auditory discrimination problems may also have auditory hypersensitivities? We hope that Phonomena is able to make adjustments in their program because a low cost option to Fast Forword is very much needed. For now, though, Earobics might be the only option, but this program has its limitations as well. (Phonomena - if you're reading, we'd be happy to re-review your software if any changes are made to it). Knossos Games (mazes, classic puzzles) are originally from the Johns Hopkins Center for Talent Development magazine, Imagine. Have fun and have a great weekend. In this recent Neuroimage paper, Geake and Hansen raise the possibility that creative analogical thinking and crystallized intelligence (IQ) are not as different as one might think. using the Copycat Project (Hofstadter and Mitchell), researchers found that sites important for the generation of insightful analogies were ones that are already known to be interesting - the frontal lobes (reasoning, deciding), parietal lobes (imagery, representations), and cingulate (conflict, selection)..yellow arrows added below. But what was surprising was how areas associated with fluid analogies (frontal, parietal activation) correlated with verbal IQ. Here's an interesting study that found that autistic subjects experienced greater amygdala (emotions) activation with direct eye gaze than non-autistic subjects. The study also found that autistic subjects were not more likely to look at 'mouths' than 'eyes' as had been found in a different study looking at motion pictures. See a previous post on the Visual Side of Autism here. Direct eye contact can also overwhelm young children's visual working memories. This may happen to some people with autism as well. The research is in. Having dinner regularly together with your kids seems to be good for every good thing - lower risk of depression and suicidal thoughts, low risk of smoking, alcohol, or marijuana use, higher likelihood of healthy eating, fewer eating disorders, and better grades. According to a Harvard study, family dinners were more important than play, storytime, or other family events for building vocabulary. And "families that engaged in extended discourse at the dinner table, like story telling and explanations, rather than one-phrase comments, like 'eat your vegetables,' had children with better language skills, said Dr. Catherine Snow, a professor of education at Harvard and the researcher of the study. Parents should be encouraged to use adult-level vocabulary and encourage back-and-forth conversation with their kids. It also helps social skills. Today, 65% of families with kids under the age of 6 have dinner together 5 or so nights per week, but that drops to 50% if a family has kids age 12 to 17. As a kid, we always got together for family dinners at our house. My dad was a big storyteller and with 4 kids, it really got busy with everyone debating current events and defending opinions. We could also try out new ideas, tell jokes, and see what everyone else was up to. These dinners were great. Once I had my own family and both of us were working, it was harder than I thought. Ultimately we fought for it, and we won. For some families, especially in the teen years, this gets harder and harder to achieve. Stick to your guns as much as possible though. Your kids may surprise you. They may begin inviting their friends to the dinner too. The Seattle Times recently reported that parents are permitted to see their children's WASL reports. This may be important for children who were surprised by failing scores. In general, it may be helpful seeing why children are having trouble on standardized or regular classroom tests. Sometimes it is because of poor test saavy, including 'careless' mistakes, bad time planning, or the need for accommodations in the setting of disabilities. Don't forget too, that OSPI is releasing a third of WASL items every year - so students can practice on actual items and become more familiar with the format and expectations of the test. "As little as three-fourths of a can of caffeinated soda makes kids act out," says researcher Alan R. Hirsch, MD, neurological director of the Smell & Taste Treatment and Research Foundation in Chicago. On teacher questionnaires, first graders were much more likely to be 'squirmy', impudent and sassy, and attention seeking if they drank caffeinated soda. The caffeine also made the children want to drink more too. So, no caffeine!